So, really, what is wrong with you people? All of you people, that is – Right and Left, all of you who are virtually frothing at the mouth at every last breathless report about every new tidbit or allegation or rumor stemming from either side of the Trump-Russia-Comey-“deep state”-collusion circus. The Russians altered our voting machines! James Comey is the Anti-Christ! Trump likes golden showers! The FBI’s secret society is framing our president! Jeff Sessions is David Duke in a mask! The Illuminati control all the Swamp Creatures! Jiminy Christmas, give it a rest already. From out here in the hinterlands – otherwise known as the real world, where people still have normal sensibilities – the residents of Political Washington look and sound like paranoid numbskulls. The outlandish blathering about an FBI “secret society” from Sen. Ron Johnson, R-Wis., was sour icing on a stale cake: Anyone with a patina of common sense combined with basic knowledge of criminal investigations understands that most of the cable-news fulminations about this whole situation are hogwash. Former FBI Director Robert Mueller is a pro’s pro, a man of honor, and a patriot. Of course he can make mistakes, as anyone can, but he won’t invent evidence from thin air, won’t countenance rank prosecutorial corruption, and won’t upend the nation’s political order just to gain revenge or satisfy his ego. He is investigating a serious matter, and doing so in a methodical, serious way. 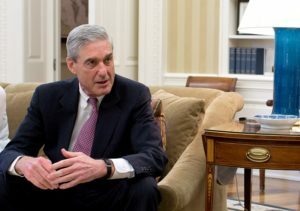 Despite all the conspiracy theories from both Left and Right, Mueller is not pursuing a pre-conceived agenda, not trying to prove that Trump personally took orders from the Kremlin, and not basing a whole investigation on some dubious dossier alleging that Trump cavorted with Russian prostitutes.